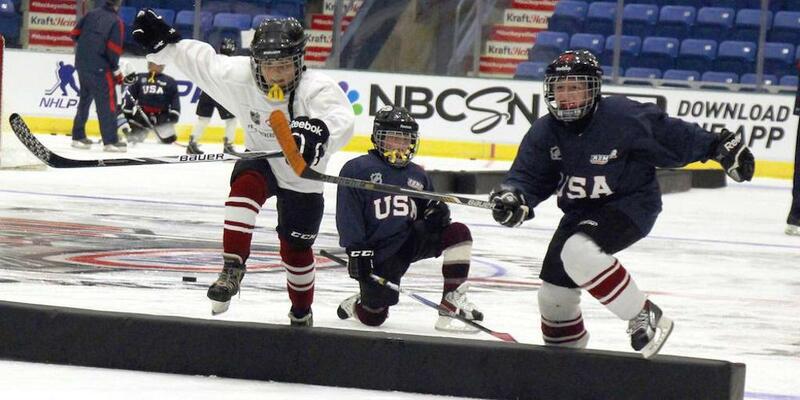 USA Hockey’s American Development Model is designed to help ensure every kid who plays hockey has a successful and enjoyable experience. Whether it’s focusing on skill development or helping young players retain information and apply it on the ice, the ADM is showing positive results across the country. One association among many seeing the benefits of ADM-based programming is Ice Hockey in Harlem, a non-profit organization in New York designed to improve the lives of children through hockey. The association serves approximately 250 boys and girls between the ages of five and 18 in Harlem and upper Manhattan in New York City. Since beginning operations in 1987, Ice Hockey in Harlem has focused on giving children the opportunity to play hockey while also teaching them how to become successful in everyday life. ADM Regional Manager Rich Hansen recently helped run practices with Harlem’s 12U, 14U and 16U players. The ice sessions were designed to focus on small-area games and force players to make quick hockey decisions, which improves their retention and, ultimately, their skill level. The ADM-based sessions that Hansen helped run certainly raised the effort level of the boys and girls on the ice. The growth of the Ice Hockey in Harlem and the impact it has made on the lives of young people in the community for more than three decades are being felt in a tangible way.